―Homer Simpson in Brick Like Me. 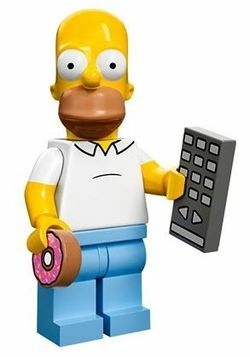 Homer Simpson is a minifigure released in 2014 as a part of The Simpsons theme. Homer Simpson a primary character of the television series The Simpsons. He is the husband of Marge Simpson and the father of Bart Simpson, Lisa Simpson, and Maggie Simpson. His neighbor who annoys him is Ned Flanders. Homer is the perfect father, at least in his own mind. He’s loving (of burgers), devoted (to napping), and patient (when he has no other choice). His interests include hanging out with his pals at Moe’s Tavern, and getting fired from his job at the Springfield Nuclear Plant almost every week. Homer Simpson Homer is the perfect father, at least in his own mind. He’s loving (of burgers), devoted (to napping), and patient (when he has no other choice). His interests include hanging out with his pals at Moe’s Tavern, and getting fired from his job at the Springfield Nuclear Plant almost every week.